I've decided I am going to stop making generalized statements about beauty products, makeup or skincare. Because just when I say something definitive, I find a product to contradict my thoughts. TYPICAL. I was never here for lip glosses, and now I am loving a ton. Buxom, Laura Mercier, Hourglass - the list goes on. Ugh, when will I learn? 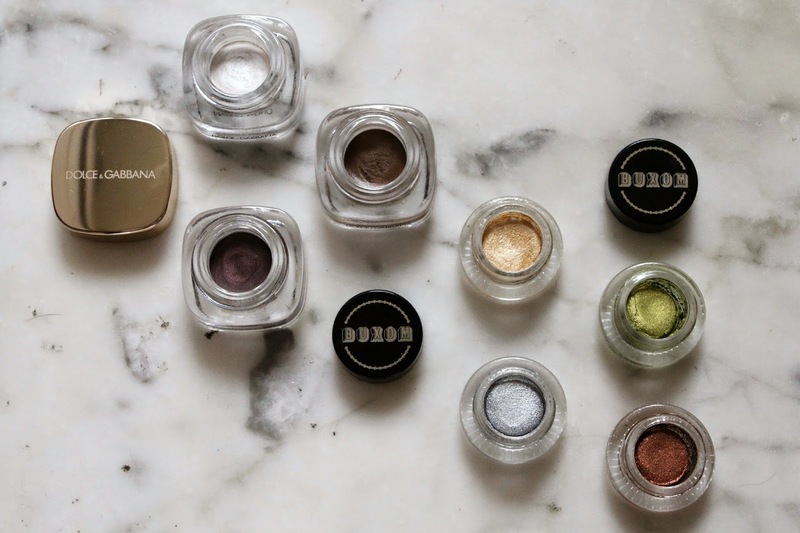 And now here I am again eating crow about cream eye shadows. I don't typically gravitate towards them and try to avoid them when I can, but lo and behold I found some I love, and have to go back and eat my words. Currently the only cream eye shadows holding court in my collection are my Chanel and Laura Mercier cream shadows. 1. 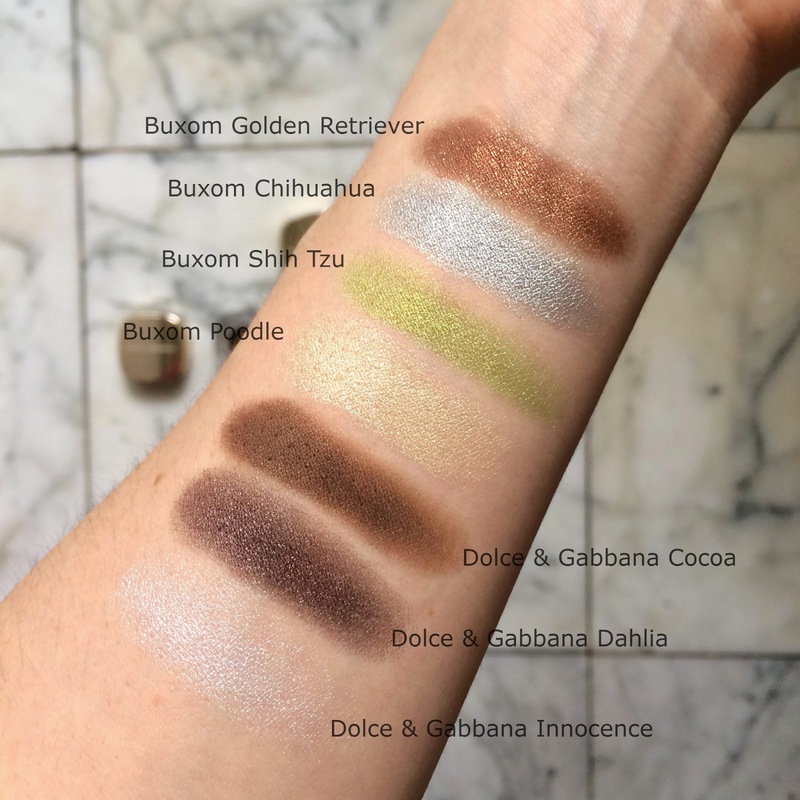 Dolce & Gabbana Perfect Mono Cream Eye Color - Though I assume all cream shadows will perform the same, in reality they are all quite different. The first thing I noticed about these D&G shadows was their intense pigmentation and how small an amount I needed to cover my entire lid. The matte shade in Cocoa was gorgeous as a base for a smokey eye, and the other two shades Dahlia and Innocence were great when worn alone on the lid. The second thing I noticed was how incredibly fast they set, so you need to work quickly. I made the mistake initially of applying too much on my lid and by the time I got around to blending it, it had set already. So use a small amount and build up. But the effect of a fast dry down time is the incredibly long wear time. These are NOT MOVING once you apply them, so make sure you plan a long day ahead of yourself because your shadow is going the distance. I still use a primer with these just because I have insanely oily lids, but I'm inclined to believe that these may wear well alone. 2. Buxom Stay-There Eye Shadows - The Buxom shadows are a tad more sheer and stay emollient on the lids for much longer so you don't have to rush to blend. They are quite shimmery when swatched but the shimmer dulls down a bit once on the lids so they can easily be worn during the day. I find that I definitely need a primer with these since they have such a creamy texture, but nonetheless they last all day once I add my trusty Urban Decay Primer Potion or NARS Smudge Proof Eyeshadow Base. Of course Golden Retriever was my favorite, but surprisingly Shih Tzu was a runner up. That golden olive green looks gorgeous when blended with warm browns or plums. Chihuahua is a stand-out silver that is little black dress approved. I can see that worn with a smokey gray eye and bronzed cheeks and lips. And while Poodle reads quite yellow on my arm, it looks natural when on my lid and has been one of my favorite colors to wear with red lipstick. What are some of your favorite cream eye shadows? Tell me in the comments below! Cream shadows are such great swipe and go products! Some of my faves are the Estee Lauder Stay on Shadow paints. These ones look so pretty, I particularly love the look of Golden Retreiver. I love the Buxom names too, so cute!